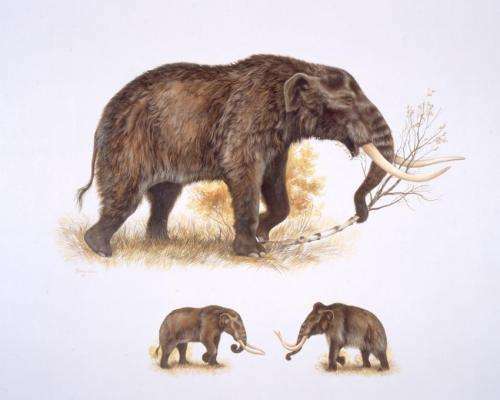 Existing age estimates of American mastodon fossils indicate that these extinct relatives of elephants lived in the Arctic and Subarctic when the area was covered by ice caps—a chronology that is at odds with what scientists know about the massive animals' preferred habitat: forests and wetlands abundant with leafy food. In a paper published this week in the Proceedings of the National Academy of Sciences, an international team of researchers is revising fossil age estimates based on new radiocarbon dates and suggesting that the Arctic and Subarctic were only temporary homes to mastodons when the climate was warm. The new findings also indicate that mastodons suffered local extinction several tens of millennia before either human colonization—the earliest estimate of which is between 13,000 and 14,000 years ago—or the onset of climate changes at the end of the ice age about 10,000 years ago, when they were among 70 species of mammals to disappear in North America. "Scientists have been trying to piece together information on these extinctions for decades," said Ross MacPhee, a curator in the Department of Mammalogy at the American Museum of Natural History and a co-author on the paper. "Was is the result of over-hunting by early people in North America? Was it the rapid global warming at the end of the ice age? 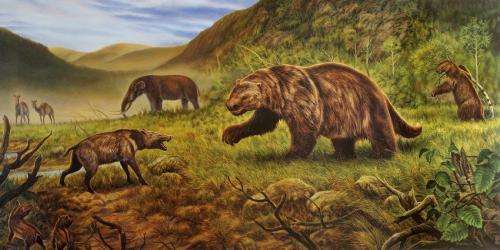 Did all of these big mammals go out in one dramatic die-off, or were they paced over time and due to a complex set of factors?" We're in a brief, inter-glacial warm period right now. In comparison, for the majority of the last 2.6 million years, massive ice sheets covering the continents has been the normal condition of our climate, because we're still technically in an Ice Age. I think a little global warming would be to our advantage. It would sure beat going "back to normal". Just think 125000 years ago, proto humans were sitting around smoking cigars and gunning their engines and warmed the planet to the temperature, actually slightly higher, than today. The CO2 output must have be tremendous. It is a good thing the proto humans are not here today or we would be at 900 degrees and warming. They look like an elephant. Can't we just call these mastodons "elephants"? And I thought you couldn't get dumber. Everybody knows the mastodons did not get onto the ark and be saved, likewise the dinos. But why did Noah save mosquitoes, the plague, and treponema pallidum? Can't we just call them "elephants"? Their genetic divergence in relation to later mammoths and modern elephants is quite well researched. The evidence doesn't support your views at all I'm afraid. Verkle thinks evolution is a lie from the pit of hell, hence his remark. Looking forward to a comprehensive view of geologic warm times. I believe it is a pattern induced by planetary alignments. Overlaid by our magnetar sun. The 65 my extinction was followed by 9 my years of heat, the PETM. This, among other patterns, continues to be followed by our planet. I wonder if tracking this particular set of environmental changes would show a shallower but same pattern of radiation/extinction and heat through time to the period of mammoth life. Since the energy from the sun and the planetary alignments would have been less, the heat producing the lush biological growth would have been not global but spotty. Exactly what we see in history.